Without much ado, Okc Music presents to you the much anticipated 'Setting On Fire' by Ibrochizyy! The track which was produced by Micky Gee & sees Ibrochizyy in Another style creating an iconic DanceAll rhythm with Awesome lyrics. 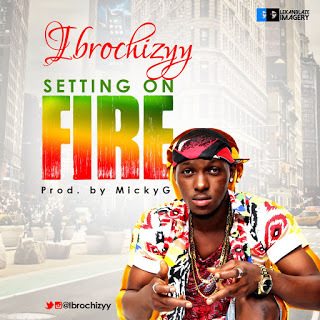 Ibrochizyy broke out in 2014, releasing his sleeper hit song – 'For You' & 'Carry Go' in 2015. His critically acclaimed cover for Davido's "Skelewu" (Peteru) which rose to top many music charts nationwide and he also featured the Queen of Love "Azeezat" on "Stay With You" which was released earlier this year still enjoying massive airplay Alongside Wande coal's Kosowo Refix with numbers of songs he has been featured on to mention few. Ibrochizyy is currently one of the most promising artiste in the Nigerian music sector, known for his #Massively slag.